Made of 100% Moso Bamboo Charcoal, this air purifying bag is non-toxic, eco-friendly and fragrance free. 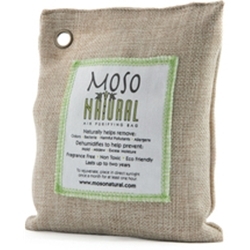 The Moso Bag naturally and effectively absorbs odors, bacteria, harmful pollutants and allergens. Available in 3 colors, the Moso Bag dehumidifies to help prevent mold, mildew and excess moisture. Use in areas up to 90 square feet.